H.P. Lovecraft, a character in Illuminatus! and a literary influence on Robert Anton Wilson, has taken another posthumous blow to his reputation. The World Fantasy Convention has stopped putting his likeness on pins given to nominees for the World Fantasy Award. 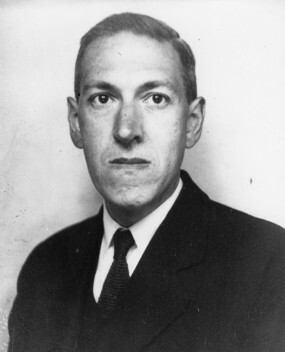 Previously, the event had stopped using a bust of Lovecraft for its actual award. News via Supergee, who does a great job of keeping up with news of fandom. It's hard to see how the folks at World Fantasy Con could have done anything else, or even why they waited so long after years of controversy. But it's a little more difficult for me to see why there's so much focus on a guy who died in 1937 and who apparently made most of his objectionable statements in private. It seems worse to me when the modern Whacko Puppies guy makes racist and sexist statements in public. I don't know what to think about the allegations against Arthur C. Clarke (for whom a major award is named in Britain) but there seems to be little doubt that Isaac Asimov spent years groping women at science fiction conventions. Why isn't there anything negative in Asimov's Wikipedia bio? I do think it's a little ridiculous, considering his worldview (he wasn't just racist, he was a complete jingoist and wasn't any nicer to white backwoods types than he was to those of a darker hue, and he talked about them more. I suspect it's because in cosmic fiction, Lovecraft won. The mythos created after he died is *the* go to...it's everywhere, and therefore his racism is somehow more unforgivable, albeit completely in line with the times in which he lived, and found in almost any adventure book written during that era. But almost no one reads those anymore, and Lovecrat is read, and referenced all over the place - in movies, TV and video games. I am surprised that Tolkien hasn't gotten much of the same treatment, but his jingoism is much subtler and therefore easier to ignore, I think. It seems to me that the fuss about Lovecraft is not an effort to remove him from the canon but rather a protest against using his image to symbolize the entire field of fantasy. Sofia Samatar objected to being rewarded for her writing with a bust of someone who considered her not quite human but added that she assigns Lovecraft stories as required reading. There is less protest about Asimov and Clarke because no organization is handing out graven images of them.